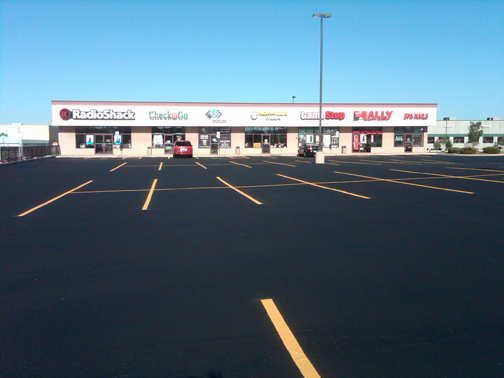 Apply a “latex & sand seal” coat within six months to one year of installation of new asphalt. Check for longitudinal cracks and have them filled annually. We recommend a seal with sand & latex every two to three years, depending on wear. This will help prevent deterioration of your pavement due to the sun’s rays, gasoline, traffic and the weather elements. Inadequate thickness of the pavement section to support the loads that travel across the asphalt. Inadequate maintenance of the pavement surface. Weak or unstable subgrade components. Asphalt is composed of aggregates that range in size from tiny sand (fines) to rocks of approximately ¾” in diameter, and it is all held together with liquid asphalt. Asphalt deteriorates when the “fines” are worn away by weather and traffic. When the “fines” are worn away, there is nothing to bind the larger aggregates together and the surface begins to ravel. This weakens the pavement section and eventually allows water to penetrate the subgrade, which leads to pavement failure. Q: What are some reasons you should complete patching in the summer, and not wait until the following spring to do so? A: The damaged area(s) will get much worse if not fixed before winter. By doing so, the new patches will be able to cure until the spring , at which time you can sealcoat the entire job. Q: What causes the sun’s rays to deplete the thickness of virgin asphalt? A: The sun heats up the binder cement, which depletes the holding characteristics of the chemical compounds in the dried liquid asphalt. This enables the stone to loosen up and fall away into curbsides, ditches and storm drains. Q: When should I seal cracks? A: The sooner the better. Any crack, which is ¼ inch or wider in the pavement, will allow moisture to penetrate to the subsurface. The goal of a good pavement maintenance program should be to keep the moisture from entering the asphalt pavement. Q: What causes fatigue cracks in my pavement? A: It is the direct result of excessive bending of the pavement surface. Asphalt will fail if subjected to repetitive or excessive bending as from vehicular traffic. A: Proper crack repair procedures can double the life of most asphalt pavements. A surface, which is five to ten years old, will usually need a ton of sealant per lane mile and will last up to ten years. Q: What is the difference between just filling a crack as opposed to routing? A: Crack filling or sealing is placement of hot material to reduce the infiltration of water. Routing creates a reservoir. The hot material is applied in the channel created, stopping the water from being able to penetrate beneath the asphalt. Q: How soon can I drive on my lot after sealcoating is completed? A: Allow 24 hours drying (curing) time after work is completed. Don’t allow traffic on your lot before the end of the 24-hour drying period. Q: How soon can I drive on my lot after new asphalt resurfacing is completed? A: Depending upon the temperature of the day, allow 6 to 8 hours before using the new lot. Q: What are some reasons that concrete repairs are much more expensive than asphalt repairs? Tight working areas are usually involved. Rebar and mesh are required to hold it together. It is much thicker than asphalt. It must be framed by hand. Materials cost more to buy and dispose of. There can be significant job down times while waiting for the concrete truck to arrive and then while waiting for the material to set up.